The Spotlight by Brittany Shawnté: Size 4 Model Fired For Being Too Fat?!!! Well, by now, I'm sure you all have heard about Filippa Hamilton, the international supermodel who was fired by Ralph Lauren, for being too fat, according to NYDailyNews.com. "They fired me because they said I was overweight and I couldn't fit in their clothes anymore," Filippa said. She also said that her contract with Ralph Lauren was terminated in April, but felt she had to speak out after a severely Photoshopped ad of her came out recently in Japan. "I was shocked to see that super skinny girl with my face," she told the NY Daily News. "It's very sad, I think, that Ralph Lauren could do something like that." The ad shown on the left has Filippa's hips shrunken greatly. Another ad (shown on the right) shows Filippa's true body proportions. Polo Ralph Lauren said in a statement Tuesday night that Filippa is a "beautiful and healthy" woman but their relationship ended "as a result of her inability to meet the obligations under her contract with us." The company also said that the ad was not meant to be released and the ad is not running in the U.S.
Filippa is concerned about the impact the ad will have on the public. "I think they [Ralph Lauren} owe American women an apology, a big apology," she said. "I'm very proud of what I look like, and I think a role model should look healthy." Now you tell me, how in the world is a girl who is 5'10 and weighs 120 pounds too fat for your ad, Ralph Lauren?! I'm seriously outraged! There is absolutely nothing wrong with this girl! And Ralph Lauren ought to be ashamed for letting a beautiful model go! 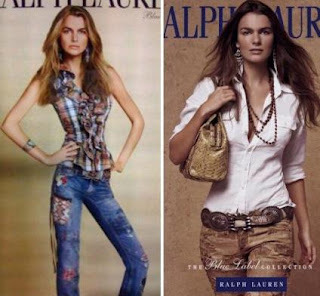 Many clothing stores, including Ralph Lauren, show these ads of ridiculously skinny girls and make females feel like this is the standard. There are so many girls in this country and in this world that have issues with their body because ads like this make them think that if they aren't skinny, that there is something wrong with them. It's sad that this is the world we live in, but people feel like this is beauty. Girls STARVE THEMSELVES to achieve this level of "perfection." But, in my opinion, it's all so unrealistic and unhealthy!